You may be surprised to learn that West Coast wine regions are excellent sources for bottlings of 100-percent counoise—in fact, you may be surprised that such varietal bottlings exist. These enterprising ventures, often side projects of major growers and producers, are an attempt to elevate a little-known variety from an obscure existence as a blending grape. While counoise may not currently exist in the vernacular of American wine consumers, a few wineries in California, Oregon, and Washington are proving this grape has much to offer. Counoise grapes at Tablas Creek Vineyards, the first place to introduce the variety in North America. Primarily used as a blending grape in Châteauneuf-du-Pape, in France’s Southern Rhône region, where it is one of the 13 approved varieties for reds, counoise represents less than 1% of planted acreage in the Southern Rhône and Languedoc regions. 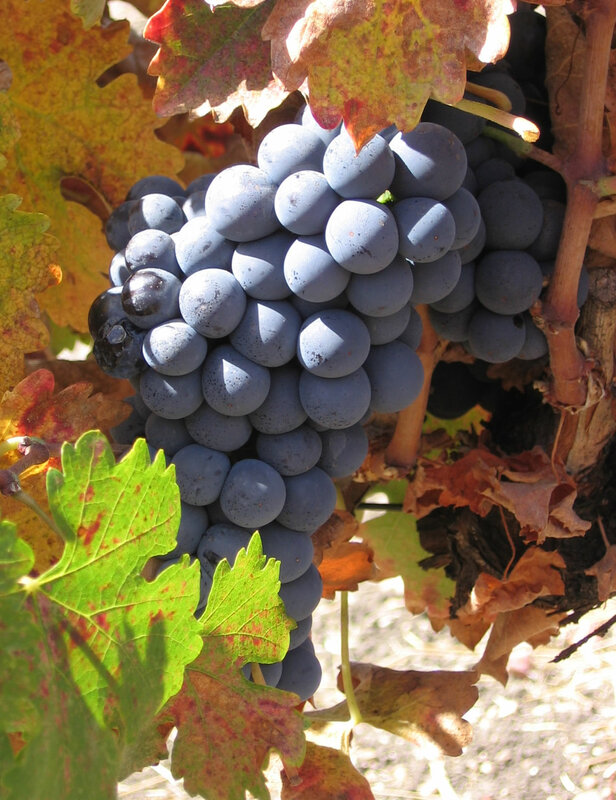 It is praised for its ability to soften the tannins and high alcohol of the more popular grenache, syrah, and mourvèdre. Counoise, when consumed on its own, is a fruit-forward wine with a plum and garnet color, boasting hints of cherry and raspberry, soft tannins, medium acidity, and an earthy finish. A lack of strong tannins and oxidative tendencies make it better for early drinking than long aging. This variety grows best in stony hillside soils with intense sun, and benefits from greater day-to-night temperature differences, like those found in the Rhône, Eastern Washington, and parts of Northern California. Tablas Creek Vineyard in Paso Robles became the first New World vineyard to plant counoise, importing cuttings from the Château de Beaucastel in 1990. This venture was part of a lengthy process to launch a California-based, Châteauneuf-du-Pape style vineyard. Other wineries soon followed this example. Jed Steele, one of the founders of Kendall Jackson and the owner of Steele Wines, north of Napa, partnered with his son Quincy in 2002 to launch Writer’s Block, a side project that currently produces nine wines under twenty dollars, including a Counoise. In addition to these California producers, Washington State has also seen the appearance of varietal Counoise. McCrea Cellars offers an 80/20 blend of Counoise and Syrah. Specializing in Rhône varieties, McCrea Cellars planted counoise in Washington in 2000, using Tablas Creek Vineyard counoise cuttings. Wine Business Monthly named Substance, a Washington winery, as one of the “Top 10 Small Hot Brands” for 2009, highlighting the winery’s Counoise as a unique pick. Finally, Cana’s Feast, an Oregon-based winery, sources grapes for its Counoise from Coyote Canyon in Washington’s Columbia Valley AVA. Originating from Domaine de Monpertuis, a winery located in Châteauneuf-du-Pape, this Old World Counoise is deep amethyst in color and exhibits a “hot” nose and high acidity that mirrors the minerality of its terroir. Dry and earthy, this French bottling offers a generous amount of tannins. However, allow it to open up and you will experience ripe, red fruit that elevates its Old World characteristics to a wine that ideally compliments a fatty and substantial fish like halibut. I owe my friends at Liner & Elsen a big thank you for performing the seemingly impossible task of locating a 100% Counoise import from France for less than twenty dollars. Aged in 100% neutral French oak, the 2009 Counoise exhibits a signature burgundy hue that looks slightly darker than your typical Pinot Noir. Spicy and sultry, this wine tickles the back of the palette just as you begin to detect hints of vanilla, raspberries, and loam. While it demonstrates its youth, Substance’s Counoise is ready to be paired with a French country dinner of roasted rosemary chicken and red potatoes. It is enjoyable by the glass but its beautiful, tight structure requires some decanting before serving. While higher in alcohol than the other two wines at 14.9 percent, the Cana’s Feast Counoise is quite simply a gorgeous drinking wine with a subtle aroma of figs and vanilla, and rich, ripe red fruit. This viscous wine is full body and defies its age with a solid structure and long, enjoyable finish. The 2008 Counoise recently earned a Platinum award from Wine Press Northwest. Comparing French and American Counoise, it’s easy to see that the grape has value beyond being simply a minor blending tool. Its character, common to all wines produced, boasts red fruit, medium acid with subtle tannins, and a distinct deep amethyst hue; you will find that the more fruit-forward offerings originate from American wineries. Counoise is a pleasant wine for anyone who loves full-bodied, supple reds—and not just oenophiles seeking to taste grapes they have never had before. Please note: Cana’s Feast and Substance provided bottles of their wines as media samples. Megan Blankenship is a marketing professional in Portland, Oregon. Between visiting Oregon wineries and planning wine events, Megan blogs at MarketingMegan.com and hunts for the best happy hours in the city. Email your comments and questions to her at m.blankens[at]gmail.com. Derby Vineyards in Paso Robles also makes bottles a Counoise that is very good and very affordable!